Vancouver is not only ridiculously beautiful, but it’s also delicious too. It has all the elements for a good meal: emphasis on local ingredients, plenty of fresh seafood, and a large Asian influence (almost 30 percent of the city’s population is of Chinese heritage). Growing up in San Francisco, I’m a sucker for places that have abundant Asian food options (Vietnamese, Korean, Japanese, Chinese and Thai are all high priorities). So when I realized Vancouver was well known for its Asian cuisine, I was sold. Mustafa who doesn’t have the same level of enthusiasm for Asian food (but is slowly warming up to it) was equally pleased with the coffee shops and beer options during our stay. Vancouver is excelling in craft beers and locally roasted coffee, so if you fancy either (or both) liquids, there are plenty of great options around town. Here’s where we ate during our short stay in town. I could not pass up on the opportunity to go to a Japanese izakaya that specializes in garlic-centric dishes. Literally almost every dish had garlic in one form or the other, and I wouldn’t have it any other way. My personal favorite was the grilled garlic shrimp-so so good. Two words: peach cider. As an avid cider fan, I’ve never had a cider with such a delicious summery twist. The food was also memorable, and in an attempt to be healthy I ordered the veggie burger, which did not make me miss the meat version at all. The space itself had such a laid back vibe, and was the perfect place to wait out the evening rain. I’m not usually one to wait long for food, but this sushi place was highly recommended for its fresh sushi, so we waited in the cold Vancouver night for 1.5 hours. Was it worth it? Um, yes. But I would highly recommend getting there when it opens to beat frozen fingers. I’m a sucker for food markets, and always try to seek them out no matter how touristy they tend to be. 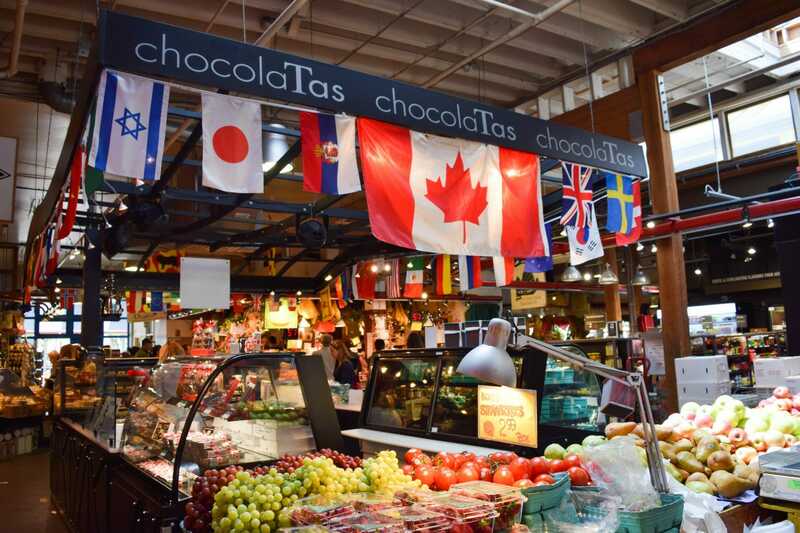 The Public Market on Granville Island did not disappoint, and after an initial lap around the stalls, we chose the Stock Market, known for their soups and stocks. Our Thai chicken soup and red snapper chowder were the perfect remedy to the notoriously overcast Vancouver weather. For fish and chips, this is a reliable place to go on Denman Street. The fish was flaky and not too oily. The fries could have been a little less salty, but then again you can’t always win can you? Get the fish and chips, and take them to nearby Stanley Park picnic-style. You won’t regret it. This was our local go-to coffee shop on Main Street that was nearby our Airbnb. The atmosphere is cozy with plenty of places to sit inside (including near a fireplace) and on the patio. Our first morning in Vancouver, we came here and I ate this insane ginger-current scone that I’ve been craving ever since. I went back again a few days later only to find they were sold out. So I got a matcha green tea donut in consolation-not a bad alternative at all. If you are near Canada Place downtown, this gelato shop is right around the corner and it cannot be missed. There are unique flavors like lavender, but the traditional ones like chocolate do the trick too. This eclectic Italian café on Commercial Drive, instantly won over my heart with its life-sized Roman statues and large selection of both gelato and Italian pastries. Commercial Drive in general is known historically as Little Italy, and has quite a few Italian coffee shops, but this one is open late and has winning décor. Have you been to Vancouver? Would love to hear your food recommendations!